Santamaría, one of the main ambassadors of Triathlon Vitoria-Gasteiz, has repeated his victory from the 2014 edition, and after coming second in 2015 and 2016, he has once again gained first place on the podium. 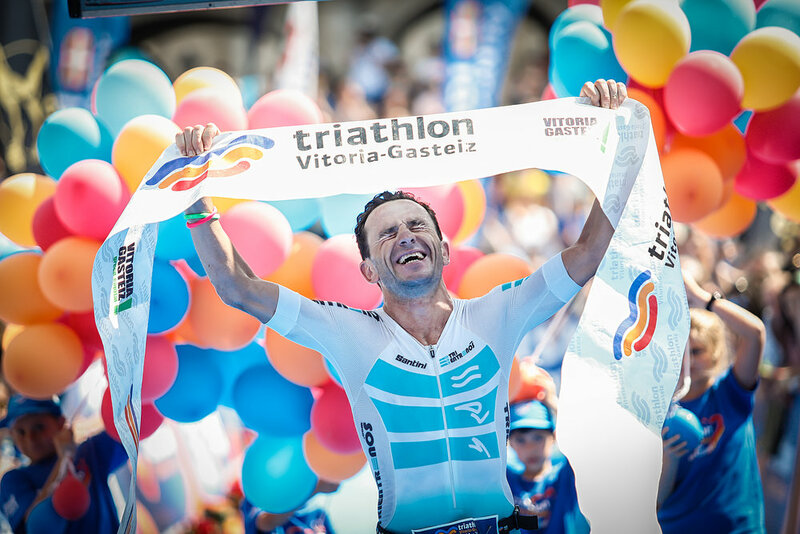 In his words, Triathlon Vitoria-Gasteiz is an event which is worthy of every sacrifice, “it’s the perfect stage to enjoy this sport we love so much, that’s why, since 2014 I never stopped dreaming about crossing the finish line in first place again”. Second place, Xavi Torrades, was also very satisfied with his performance, commenting that he felt good all through the race, “despite losing some positions in the cycling leg, I was able to recuperate them thanks to the good pace I managed to achieve in the running leg”, at the beginning keeping up with Santamaría who later forced him to ease off. The podium was completed by Raúl Tejada. The triathlete from Guatemala expressed his gratitude to the spectators who have lined the streets of Vitoria-Gasteiz, “they motivated me to give all I had”. He went on to say how happy he was to achieve a podium position, finally getting rid of the bitter taste which he was left with after his fifth place in 2016 in the HALF distance and showing a clear improvement. It was an exciting race in the female category, with many possibilities, but in the end, the Croation Sonja Skevin came through, with a time of 9:29:04, followed by the Portuguese Vanessa Pereira with 9:33:36 and Ruth Brito, from the Canary Islands but resident in Vitoria-Gasteiz, who finished in 9:34:14. On crossing the finish line, the winner was jubilant, “I loved this race, I’ll definitely be back next year”. Skevin underlined the role that strategy played in her victory, “my trainer told me to push hard in the cycling leg in order to be among the first positions, and after doing that I felt really good in the running leg”. The most exciting battle of the day was that for the podium places in the female FULL category, with a number of athletes immersed in a duel from which Vanessa Pereira and Ruth Brito managed to distance themselves. Ruth launched an attack with only 10 kilometres to go, to which only Pereira was able to respond, overtaking her in the final stages of the race. Ruth Brito, a regular on the Triathlon Vitoria-Gasteiz podium, wanted to thank the town for its affection, on crossing the finish line, “I thought it would be very difficult to gain a podium place, but thanks to all of you, I did it”. She went on to highlight the work carried out by the organizers in developing the event, “every year the level of international triathletes coming here is higher, which is why today’s race was so hard”. Once again Triathlon Vitoria-Gasteiz has been a success both on an organisational level and in terms of attendance - the spectators have lined the streets of the town throughout the whole day. Triathlon Vitoria-Gasteiz 2018 is now a story with a happy ending. We’ll see you in 2019.